This summer's trip to Greece came at the tail end of a. long trip, after we'd wrapped up Namaslay® Thailand, and hit Oman for a collaboration with Shangri-la Al Husn Resort and Spa. 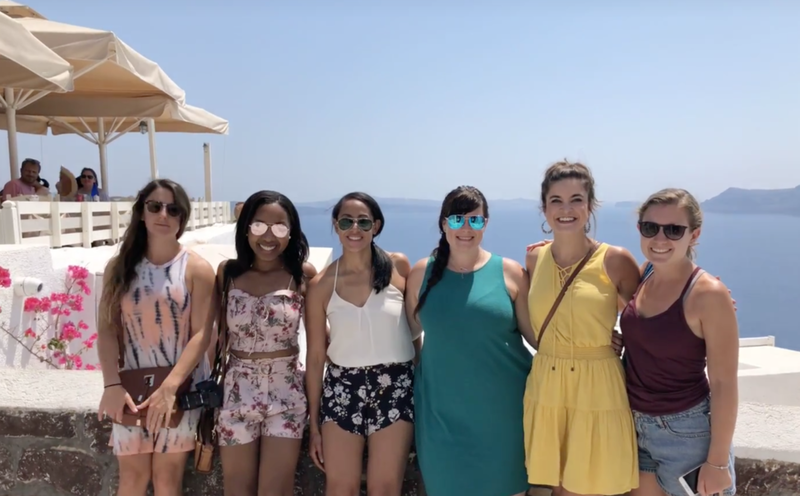 We spent a week in Santorini, meeting our fantastic group of seventeen for a yoga retreat, and then Danny and I went to Athens for a few days because it's cheaper to fly home from Athens than it is from Santorini. The Santorini retreat is one of my favorites. It was our second time visiting the island and it did not lose its luster. This time on the island Danny and I spent more time away from the white washed, blue capped, photogenic town of Oia. At first glance, it is easy to think of Oia as the only place to be in Santorini. This is not the case. We rented a car and went exploring. We found beaches, restaurants, swimming holes, and views that we didn't expect to see. We asked the locals where to go and what to do and they did not disappoint. It is similar to coming to NYC for the first time - a foreigner would be eager to go see Times Square and soak in the city. But if you ask any local where to go, the first response is to stay away from Times Square. Oia is very much the same, it is beautiful, yes, but each time you walk around the streets you feel less and less inclined to come back. There is so much to Santorini that goes unnoticed due to the attraction to that one area. We had 17 students in our retreat this year and they were all fantastic. It's like what they say - 'Your vibe attracts your tribe' and every time I meet a YBCer it feels more and more true. I love meeting the students, hearing where they are from and learning about their journeys. We had days packed with yoga, shopping, eating, and adventure. The group rented a yacht and went sailing around the island. 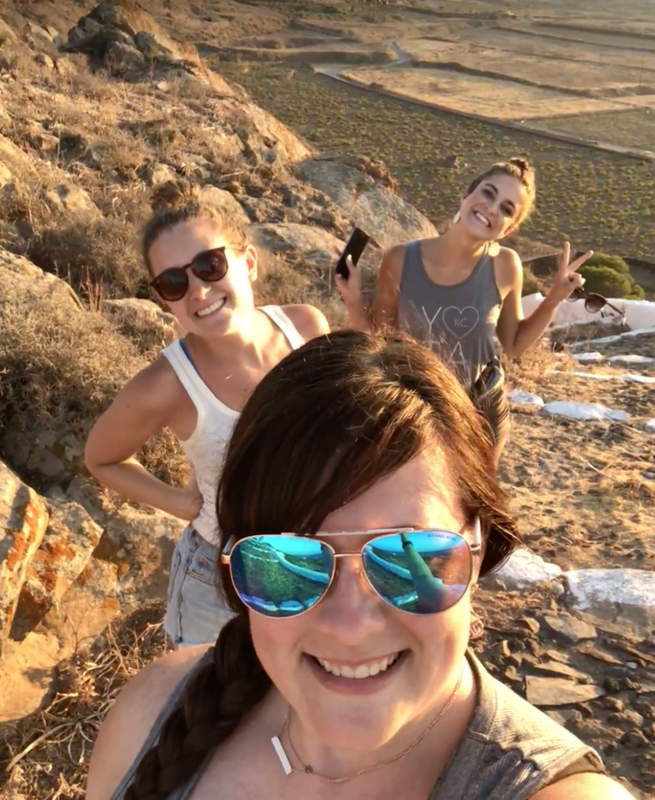 They went on a wine tour, and experienced some of the best sunsets of their lives. It was bittersweet because the resort we stay at is fully booked for next year, so there won't be a retreat for us there next summer. We will be back though, don't think I can go 12 months without visiting! In April we will be running our Namaslay® 200HR Yoga Teacher Training at Hotel Pelagos. They agreed to open some dates for us before the season starts and we couldn't be happier. After the retreat we sailed off to Athens. Literally, we took the ferry. The wind was blowing and the waves were high so the ferry took a little longer than expected. Usually it is 5 hours, but this trip was closer to 7. Luckily, I was too exhausted to feel seasick - I slept through nearly the entire journey. Our stay in Athens was our last stop on our 7 week trip. We were exhausted, run down, tired, hungry, homesick - everything! We rented an AirBnB in a nice loft apt. We found out very quickly that the area we were staying in was a little "dodgy" - a term our Athenian friend was quick to use. We are talking open drug use, streets littered with dirty needles, brothels on the corner, and offensive graffiti covering every square inch. But like most areas off the beaten path, there were some gems. We were upstairs from some great restaurants/cafes and even though it was a holiday weekend in Greece at the time, we were able to get some good food. It was also walking distance to the Acropolis where Dan went for a day. I had already seen it a few times before, and was trying to catch up on work. We put together a little vlog of our travels, and hope you guys enjoy. Let us know your thoughts down in the comments below!